This year the Chinese New Year and the Year of the Rabbit began on February 3. Chinese New Year is an exciting time to be with family, give gifts, wish others good luck, good health and prosperity - and best of all it's a time to celebrate with lots of great food. Noodles represent good health and long life, so what better way to celebrate the Chinese New Year than to make a noodle recipe! 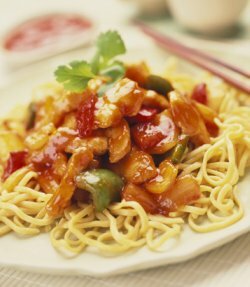 Thanks to everyone who submitted a recipe for the Noodle Recipe Contest! Contest winners will receive an e-gift certificate - choice from various world-wide online retailers. Click on the links below to browse the noodle recipes that have been submitted by other visitors, and the ratings and comments they have received. You can also make a comment or rate a recipe.